Whether you’re already a user of the app or new to it, Cultured Code’s Things can help you manage your to-do list with ease and style. The new iPad version runs $20 and is a slick-looking app, as you’d expect from an Apple Design Award-winner. The iPad app’s features are very similar to its desktop counterpart, allowing you to create to-dos and schedule them on the go. 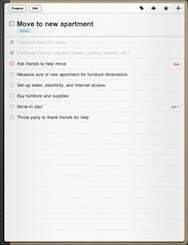 You can have them show up in your list of things to be done today or have the app remind you to do them at a later date. It also allows you to group sets of tasks under the Projects tab, which brings more organizational structure to the things you need to get done. One of the biggest draws of Things is that it can sync with both its Mac and iPhone counterparts—which cost $50 and $10 respectively—over Wi-Fi, making your to-dos available to you on any platform you use. The company intends to add cloud-based syncing as well in future versions of the apps. Things for iPad is now available on the App Store for $20 and is compatible with any iPad running iPhone OS 3.2 or later.